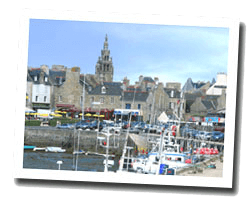 Roscoff is a corsair preserved city and a major cross-Channel port from Plymouth. The coastal path offers breathtaking scenery with views of the island of Batz. A naval doctor created there the first thalassotherapy center in France. At the seaside you can find an Exotic Garden with 500 species of plants. There is a beautiful beach on Morlaix bay. 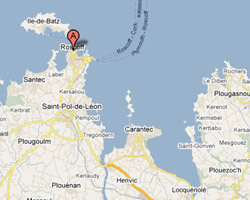 In Roscoff enjoy a seaview holiday rental. Villa 5 rooms 210m2. terrace. balcony. Sauna. Jacuzzi. Pets allowed. 3 Bedroom(s), Final cleaning : included. Villa 7 rooms 200m2. Close to the beach. terrace. Swimming pool. Pets allowed. For holidays, running on the beach at any time of the day without taking the car, you dream of seeing the sea from your living room. Price from 2500 € to 3500 €. Large modern villa. Terrace, garden with deck chairs . Private heated outdoor swimming pool. Distance to the sea: 100 m. View of the sea. 5 Bedroom(s), 2 double bed(s). 4 rooms House. Terrace, shared garden with deck chairs . Shared outdoor swimming pool. View of the sea.